Godfrey Binaisa who has died aged 90, was a prominent feature of Ugandan history, from the years of the country's agitation for independence from Britain, to the turbulent postcolonial decades of the 1960s to the 1980s. Binaisa briefly ruled Uganda as President at a time when the country was recovering from Idi Amin's tyranny and with Tanzanian troops in control of much of Uganda. Binaisa is credited with crafting the ideology of inclusiveness under the slogan of "Ekigaali" or "Umbrella", which sought to bring different factions together, a position that was adopted by and later turned into one-party rule by the current president, Yoweri Museveni. 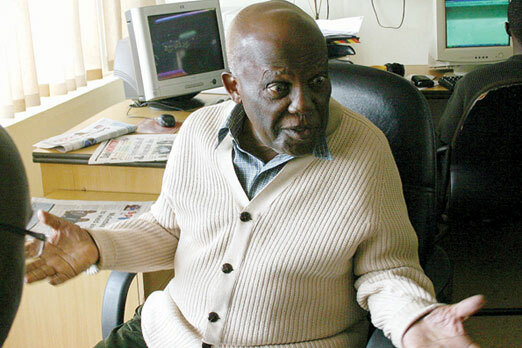 Binaisa was perhaps the proverbial cat with nine lives; as part of the political establishment, he incurred the wrath of British colonial officials and later that of Ugandan political leaders including Amin. Colourful and often controversial, Binaisa was also a successful lawyer becoming Uganda 's first indigenous attorney-general, and from 1957 to 1971, won all the major political suits he was involved in. Godfrey Lukongwa Binaisa was born in Mityana on May 30, 1920. His mother was Naome Nantume Manyangwa. His father, Aninia Binaisa, was a blue-blooded clergy and headmaster of the local Anglican secondary school. Father and son mostly followed different paths in life. While his father chose a life of chastity, the young Binaisa was a shrewd businessman. Aged thirteen, Binaisa as the first child was already working on the family's farm and although his father warned him to give the farm's produce free to his congregation, the young Binaisa was instead selling the produce to them, much to his father’s horror . Binaisa was a brilliant student and was admitted to read law at Makerere College (now university) at the age of 17. His first serious brush with the law happened in his freshman year, when his collection of stuffed rare animals and bones, which he was selling to Europeans was discovered by the college's authority. Since he had no licence, the materials were confiscated and became the foundation for the present day Ugandan Museum. Almost three years later in 1940, he was finally dismissed from Makerere for taking part in a campaign against the British war effort and was banished from Kampala. A year later, when the colonial government was looking for native businessmen to boost mining for the war effort, Binaisa was pardoned and granted a mining licence. Now a rich businessman, in 1945 Binaisa married his first wife Ruth Namakula, who was reputed to be one of the most sought-after women in Uganda at the time It was a lavish ceremony, which was also the first European-style wedding among Ugandans. In 1947, he helped start a campaign against British rule as a senior member of the radical Bataka movement. A demonstration organised by the group in 1949 turned violent and when the movement's leaders were arrested, Binaisa was reported to have betrayed his colleagues to the colonial government. For this effort, he was rewarded with a scholarship to study geology and mining at Glasgow University. But instead of studying, Binaisa was partying and the scholarship was cancelled. He moved to London, lived rough for a while before working at the Indian High Commission, and studying law at King's College, University of London. He was called to the bar in 1956 at Lincoln's Inn. Binaisa returned to Uganda 1956 to start a law practice and to partake in the agitation for self rule from Britain. In 1959, as the leader of the Ugandan Underground Movement, he gave a January 1961 deadline for the British to depart Uganda and led the campaign against the Queen Mother's visit to the country. That October, he was arrested by the colonial police and was initially charged with being "indirectly responsible for a reign of terror" that included arson, petrol bombings, assault, farm destruction and political intimidation. To avoid the reprisal that a long criminal trial could cause, the colonial authorities instead tried Binaisa under the Deportation Act and he was banished again to a remote Moroto village in Karamoja District. A year later, the Buganda Kingdom was seeking to become independent from Britain as a separate state from Uganda, which the British were against. Knowing that Binaisa is of royal Buganda blood with great influence in the kingdom, the government decided to pardon him on the condition that he convince his people to remain part of Uganda. Binaisa agreed and he mounted a spirited campaign against the Buganda declaration of independence and secession. His marriage broke down at this period and he was in the opposite camp to his father who was pro-Buganda. Independence came, and Binaisa, who in 1959 had been declared the greatest law breaker in Uganda , became, 30 months later in May 1962, the country's first native attorney-general. He married Irene, and with Milton Obote as president, helped re-write the constitution in 1967. But a disagreement with Obote a year later led to Binaisa's resignation and he returned to private law practice. He was doing well as a lawyer until 1972, when Amin having ousted Obote in a coup, branded Binaisa a Zionist sympathizer because he was an attorney for the Israeli embassy. He went into exile, first in London and then New York, where he continued to practice law and also led an anti-Amin campaign. Binaisa returned to Uganda in 1979 after Amin was finally overthrown and Binaisa was made president June of that year. Binaisa was ousted from government eleven months later, by a military clique that included the current president, Yoweri Museveni, after Binaisa tried to remove the chief of army staff. Binaisa was on the run again, seeking exile first in Kenya, which expelled him in 1981, and then Britain where his second marriage broke down. He moved to America in 1987, settling in New York to practice law, before returning to Uganda in 2001. The 84-year old Binaisa caused a worldwide sensation in July 2004, when he married a 58-year old Japanese woman Tomoko Yamamoto, without meeting her. The marriage organised by the Unification Church was conducted via satellite link. The marriage ended in June 2005. Since his return to Uganda , Binaisa had been a supporter of President Museveni, as his former underling and enemy rewarded Binaisa with a pension, a house and a chauffeur-driven car. Binaisa is survived by three sons and four daughters. A son Charles Binaisa pre-deceased him in 1969. Godfrey Lukongwa Binaisa, politician and lawyer, born 30 May 1920; died 5 August 2010.